After a five-month warm-up of hotel-mezzanine food service and takeout lunch, Má Pêche, a.k.a. 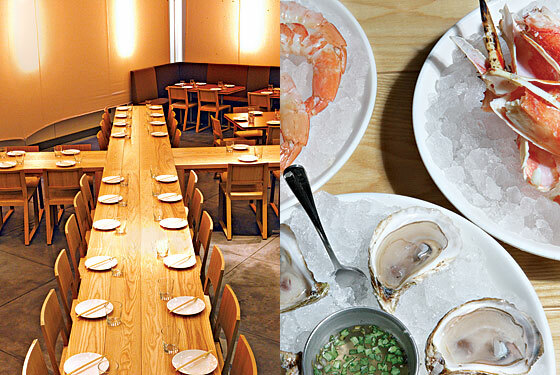 Momofuku Midtown, makes its official (lunch-only, no-reservations) debut this week. What was once Town restaurant has been redesigned by Thomas Schlesser as an artfully simple series of distinctive spaces. The front door opens into a takeout branch of Momofuku Milk Bar, selling the bakery’s signature Compost Cookies, Cereal Milk, and Crack Pie to go. Beyond is the host stand and the sleek Balcony Bar, open all day for breakfast, lunch, and a limited bar menu until 11 p.m. Down a flight of stairs, stretched-canvas panels cocoon the roughly 85-seat dining room, home to a crisscrossed communal table, a four-stool raw bar, and a single esoteric artwork (Bad Route by Miguel Calderón). Schlesser calls the layered juxtaposition of eco-friendly materials like plywood, particleboard, and fiberboard a metaphor for the mixing of cultures evident on chef Tien Ho’s trilingual menu, which applies French and Vietnamese words (and English descriptions) to Asian-inflected bistro staples. “Bò tartare” is made from Niman Ranch beef, scallions, and mint; “raie a la Dufresne” tweaks brown- buttered skate with lime and pea shoots in a sly nod to wd-50 chef Wylie; jowl croutons and tripe transform the classic frisée aux lardons. To drink: wines ranging from Moroccan Syrah to Red Hook rosé. Fabrizio and Nicola Carro, Piedmont natives and identical twins who run the kitchen of Miami’s Quattro Gastronomia Italiana, must be the envy of every multitasking celebrity chef. (Imagine what Mario Batali would give for a twin brother who could cook?) Now, Fabrizio has moved up north to helm a new Quattro outpost at the Trump SoHo, while Nicola remains in Florida. The design of the bi-level space echoes its sister restaurant with black granite and leather banquettes, and the menu covers familiar regional Italian ground, from arancini to vitello tonnato to the signature braised-beef-filled agnolotti. Fabrizio, a good Italian, will proudly import as many ingredients from the old country as possible—screw the food miles—but says he isn’t opposed to exploring our city’s Greenmarkets too. This week, Paul Grieco and Marco Canora open the second branch of their gleefully anti-establishment wine bar, a space with almost triple the seats and a bona fide kitchen. This means Canora can augment Italian snacks like bone-marrow bruschetta (pictured) with fried meatballs, new sandwiches, and a thin-sliced dry-aged sirloin. Grieco’s so-called wine lists—three-ring binders that are the madcap Beard Award–nominated work of graphic designer (and Gramercy Tavern captain) Steven Solomon—are new for this location and cull from all corners and cultivars, including a Finger Lakes Riesling on tap.